Jeanne II, Tainted Queen – History… the interesting bits! In 1312 a baby girl was born into the French royal family. Although some sources say she was born as early as 1309 or 1311, most seem to settle on January 1312. According to Isabella of France’s biographer, Kathryn Warner, the news was delivered to Edward II and Queen Isabella by Jeannot de Samoys, usher to Margaret of Burgundy, in March 1312, with the baby having been born on 28th January of that year. Jeanne de France was to be the only surviving child of her parents, Louis of France and Margaret of Burgundy. Louis had become King of Navarre on the death of his mother in 1305 and was married to Margaret later in the same year, when Louis was 16 years old and Margaret was about 15. Louis was Dauphin of France, the eldest of 3 surviving sons of Philip IV le Bel, king of France and Navarre, and of Jeanne I, queen of France and de jure queen of Navarre. Louis’ sister, Isabella, married Edward II of England. His brothers, Philip and Charles, were married to 2 sisters, Blanche and Joan of Burgundy, the daughters of Otto IV, Count of Burgundy. In 1314 a scandal rocked the French monarchy to its very core, leaving a question mark over Jeanne’s legitimacy that is still there today. The Tour de Neslé Affair saw 2-year-old Jeanne’s mother, Margaret, convicted of adultery, and imprisoned in the Chateau-Gaillard for the rest of her life. Margaret’s cousin and sister-in-law, Blanche, was convicted alongside her. Although Blanche’s sister, Joan, with the support of her husband Philip, was cleared of the charges, she was held under house arrest for a short time as it was believed she knew of the adulterous liaisons of her sisters-in-law. The 2 knights in question, the D’Aunay brothers, were tortured and castrated before being brutally executed by being ‘broken on the wheel’ and decapitated. How much Jeanne would have known of these events is uncertain. Hopefully she was shielded from events in the royal nursery, but it is not inconceivable that she was treated differently after the discovery of her mother’s adultery. Margaret’s betrayal meant Jeanne’s legitimacy was now in question. However, events were to change again within in months. In November, 1314, Jeanne’s grandfather Philip IV died and her father succeeded to the French throne as King Louis X. Louis was now desperate to produce a male heir and with the papacy dragging its heels on his divorce from Jeanne’s mother, it’s possible he took matters into his own hands. Whether it was from natural causes after her rough treatment – or, more likely, strangulation on Louis’ orders – Margaret died shortly after Louis’ accession. 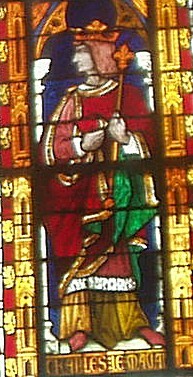 Louis then married Clementia of Hungary and the couple were crowned jointly at Reims in August 1315. Nothing is recorded of the relationship between Jeanne and her stepmother, or of how Jeanne’s status changed as the daughter of the King. However, doubts over Jeanne’s legitimacy must still have been at the forefront of people’s minds as Louis X, on his deathbed in June 1316, made a point of stating that Jeanne was his legitimate daughter. Clementia was pregnant at the time of Louis’ death, after a particularly strenuous game of tennis; their son John the Posthumous was born 5 months later and died just 5 days after that, causing a succession crisis. In most countries, Jeanne would automatically have become queen regnant on the death of her baby brother. However, her uncle Philip argued that French Salic Law, which determined the inheritance of French property and which stated that females could not inherit, also extended to the crown of France. Fearing the accession of a weak and feeble woman, the French nobles readily agreed. Salic Law, however, did not extend to Navarre and Jeanne’s maternal grandmother Agnes of France, Duchess of Burgundy, and maternal uncle Odo IV, Count – later Duke – of Burgundy, tried to press Jeanne’s claims to the crown of Navarre, but were unsuccessful. 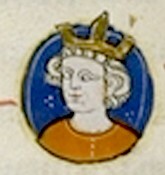 In 1318 Odo came to an agreement with Philip that, should he have no male heirs, the counties of Champagne and Brie would go to Jeanne, while Jeanne would relinquish her claims to the thrones of France and Navarre – and would swear to this once she reached her majority, probably at the age of 12. In the same agreement Odo was to marry Philip V’s daughter, Joan, and Jeanne would marry her cousin, Philip d’Evreux. Philip was the grandson of Philip III of France and his 2nd wife, Marie of Brabant; he was the son of Louis d’Evreux, half-brother of Jeanne’s grandfather, Philip IV. At just 6 years old Jeanne was married to 12-year-old Philip on 18th June 1318. She was then given into the care of Philip’s grandmother, the dowager queen Marie of Brabant, to continue her education. 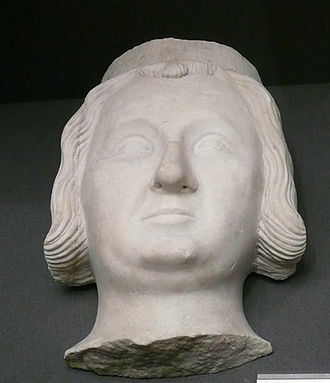 There’s no evidence that Jeanne did relinquish her claims to the thrones of France and Navarre on her 12th birthday and the situation changed, again, when Philip V died in 1322 and was succeeded by his brother, Charles IV. A succession crisis arose yet again when Charles himself died on 1st February 1328, leaving France with a regency once more, until his pregnant wife, Jeanne d’Evreux, was delivered of a daughter, Blanche, on 1st April 1328. This left Jeanne as the senior claimant to the French and Navarrese thrones. However, with Salic Law still in place, the French crown was offered to Philip of Valois, a descendant of Philip III, who acceded to the throne as Philip VI. Philip, however, had no claim to the crown of Navarre as it had come to the French crown through the marriage of Philip IV with Queen Jeanne I of Navarre. Not subject to Salic Law, therefore, and after the extinction of the male line, the crown of Navarre finally came to Jeanne, her inheritance was publicly acknowledged by the new king of France. 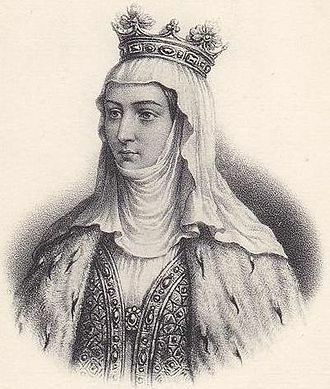 The general assembly of Navarre proclaimed Jeanne as queen in May 1328, with a stipulation that Philip would reign jointly with her, but only until their eldest son attained his majority. 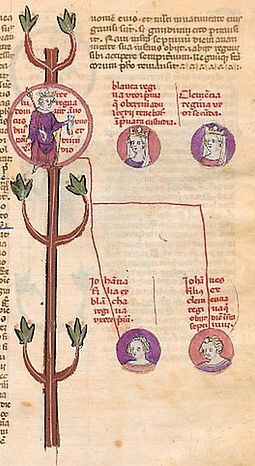 After years in the shadows and aged just 17, Jeanne and her husband were crowned jointly, as King Philip III and Queen Jeanne II of Navarre, at Pamplona on 5th March 1329. Several property agreements with the French crown left Jeanne and Philip with extensive lands in Normandy, Champagne and Philip’s county of Evreux, as well as their kingdom of Navarre. Their marriage also appears to have been successful, with at least 7 children being born between 1326 and 1341, 3 of which were boys. Their eldest child, Maria, became the 1st wife of Peter IV of Aragon; while the next eldest, Blanche, born in 1330, was betrothed to John of France before marrying his father, Philip VI – who was 40 years her senior – in 1349, just months after her mother’s death. Of their other daughters Agnes, born in the mid-1330s, married Gaston, Count of Foix. According to Froissart Gaston accidentally killed their only son, another Gaston, during a quarrel. 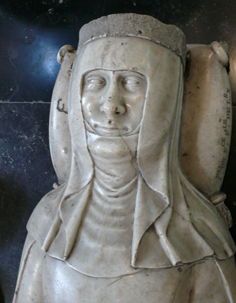 Jeanne’s youngest daughter, Joan, was born in 1339 and would marry John II Viscount Rohan. Some sources mention another daughter, Joan, born around 1324, who would become a nun at Longchamp. However, it seems highly likely that Joan was an illegitimate daughter of Philip d’Evreux, rather than the eldest daughter of the Philip and Jeanne. Jeanne and Philip’s eldest son and heir, Charles II the Bad, was born in 1330 and married Joan, daughter of John II of France. Charles was implicated in the assassination of the Constable of France, Charles de la Cerda, and intrigued with the English, against the French, during the Hundred Years’ War. He even escaped from imprisonment in Chateau-Gaillard, but was ultimately defeated by the French, who allowed him to remain as King of Navarre. A son, Philip, Count of Longueville was born in 1336 and married Yolande of Flanders. While their youngest son, Louis, was born in 1341 and would become Duke of Durazzo in Albania by right of his wife, Joanna. Jeanne and Philip shared their time between all their lands, with French governors installed to rule Navarre during their absences. As rulers of Navarre, Jeanne and Philip had active legislation and building programmes and tried to maintain peaceful relations with neighbouring states. As a couple they appear to have worked closely together, more than 41 decrees were issued jointly in their names. Philip died in 1343, aged 37, whilst on Crusade against the Muslim Kingdom of Granada in Spain. He was mortally wounded by an arrow during the Siege of Algeciras and died shortly after. 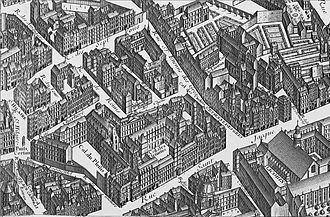 His body was returned to Pamplona for burial, while his heart was taken to Paris and interred at the Couvent des Jacobins. From then on Jeanne ruled alone, dying of the plague on 6th October 1349 at the Chateau de Conflans. She was just months short of her 38th birthday, having ruled Navarre for 21 of her 38 years. Jeanne was buried in the royal Basilica of St Denis but her heart was laid to rest beside her husband’s in the Couvent des Jacobins, the taint of bastardy no longer an issue. Thanks to Kathryn Warner for her extra information regarding Jeanne’s date of birth. Sources: The Course of French History by Pierre Goubert; Isabella and the Strange Death of Edward II by Paul Doherty; Isabella of France: The Rebel Queen by Kathryn Warner; The Waning of the Middle Ages by J Huizinga; Medieval Europe 400-1500 by H.G. Koenigsberger; passion-histoire.net; maison-hantee.com; herodote.net; histoire-france.net; A history of France from the Earliest Times to the Treaty of Versailles by William Stearns Davis; History of France by Charlotte Mary Yonge; Histoireeurope.fr. Very interesting. What was even more interesting to me was that the Count Odo of Burgundy mentioned in your article must have been a distant but direct descendant of Count Odo who was both a rival and an ally to Charles Martel in the 8th century. I am currently writing the screenplay, but after that will work on the novel “The Franks”, where Odo is a significant character both in repelling the Muslim invasion of central and northern Europe and in the early formation of the empire Martel’s grandson, Charlemagne, would someday inherit. Hope you don’t mind if I reblog this? H/T History … the Interesting Bits!